So sorry my page went down due to a technical fault and it took a while to fix it. The page as you can see is back up and I will be posting the next report shortly. Happy New Year from Jo! I hope you all had a great Christmas and thanks for your continued interest! 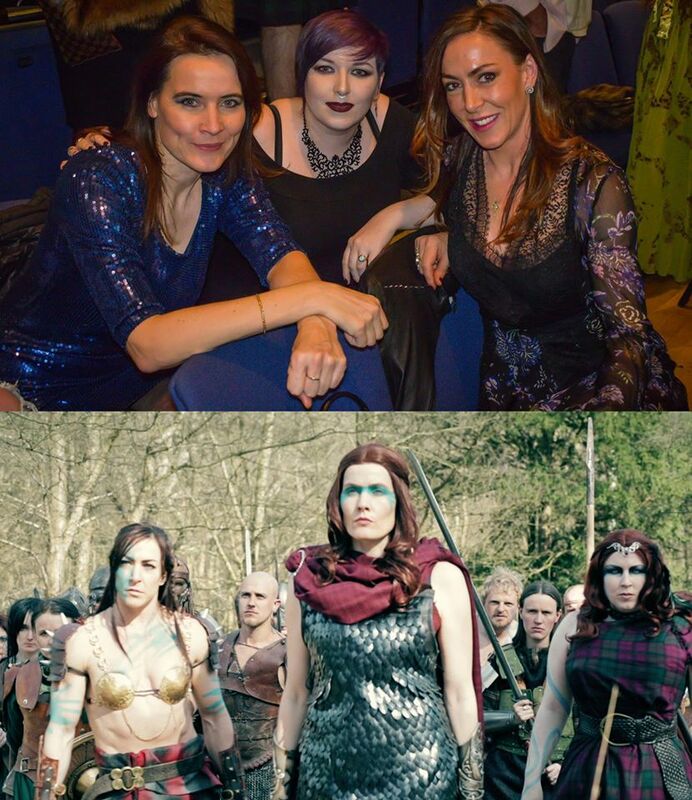 Since I posted last, Birmingham Memorabilia was approaching and this time I decided Xena was due for an outing again. Always enjoying going to Mem, it was incredibly busy on the Saturday and the crowds and narrow aisles created some bottle necks but thankfully was calmer on the Sunday. 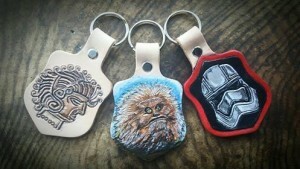 Loving talking to and seeing some of the awesome artists there showcasing their work. Looking forward to the March one so hopefully may see some of you there. Thanks to Keogh’s Photography photo at the top of this post for a great photo! 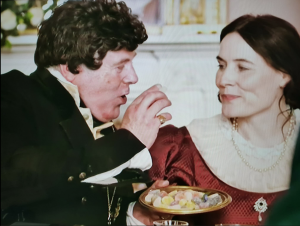 The Private Lives of the Monarchs has aired on the Yesterday Channel and you can see me pop up a few times on the episode of George III and the Prince Regent. I think its still be played and you can catch it on the UKTV Player. Beginning of December saw Sean and I pop over to the Isle of Wight for the Victorian Christmas weekend at Osborne House. This time we were on the fairground stalls as they were not running the crafts, bit of a change and thankfully the weather was dry although chilly. Always enjoy popping over the the IOW, especially in the summer as its really pretty. A very cool gig came in for a corporate Christmas party with an Enchanted theme. 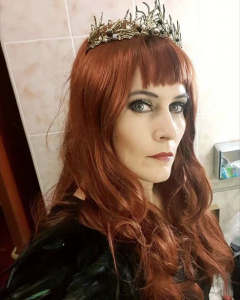 I was asked to appear as an Evil Queen character and they had a purpose built grotto with cauldron which looked awesome! I was there asking the guests some fairytale themed questions in which they had a chance to win tickets to see the show Wicked and an evening meal for 2. I wore my unfinished Maleficent dress (without the collar and headpiece) with my Morrigan crow cloak. The combination of the 2 with my red wig and a crown looked great. It was really fun to do and had a great time! Here is a quick selfie! 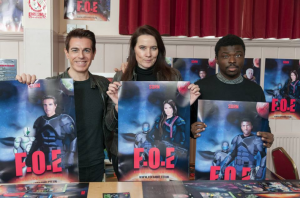 Sean and I made an appearance to help promote the new FOE Board game I mentioned in my last posting. 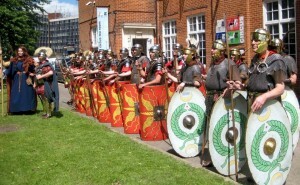 We headed down to an event near Southampton to chat to the public and even play a battle against some of the attendees. Needless to say my overall score was the best The Empress rules supreme! 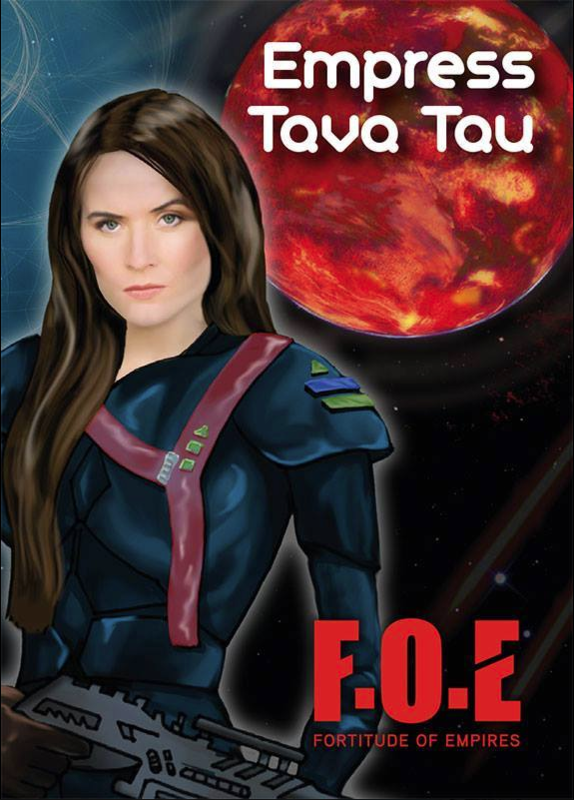 Here you can see our great promo posters of our characters in the game. It was a real fun day and hopefully raise awareness of the project. Please check out the FB Page for more photos and details of the event and game itself. With the release of Star Wars The Last Jedi just before Christmas, this led to several appearances as Stormtroopers all over London at different cinemas for private screenings. A mixture of original and new trooper bookings, with one of my favourites being at the Electric Cinema on Portabello Road where we stood outside of the entrance as the guests arrived. We created at lot of interest from the guests arriving and the passing public on ther way home. Here we are just before we stood outside, if you haven’t been to this cinema I highly reccommend it as inside you have large leather seats and foot rests to relaxing in whilst watching the film! Nice. The last appearance before Christmas saw Sean and I returning to Woburn Centre Parcs as Jack Sparrow and Elizabeth Swann for the Breakfast with Santa. A really enjoyable one this as you can spend time talking to the families and seeing how excited the children are. The other nice bit is we get fed afterwards the yummy breakfast! Winners all around lol. Well thats it for the now, here is to a fantasic new year ahead and many more fun filled adventures!! Ok ok I’m sorry, I’m even later in posting a new report this time the time whizzes by so quickly! 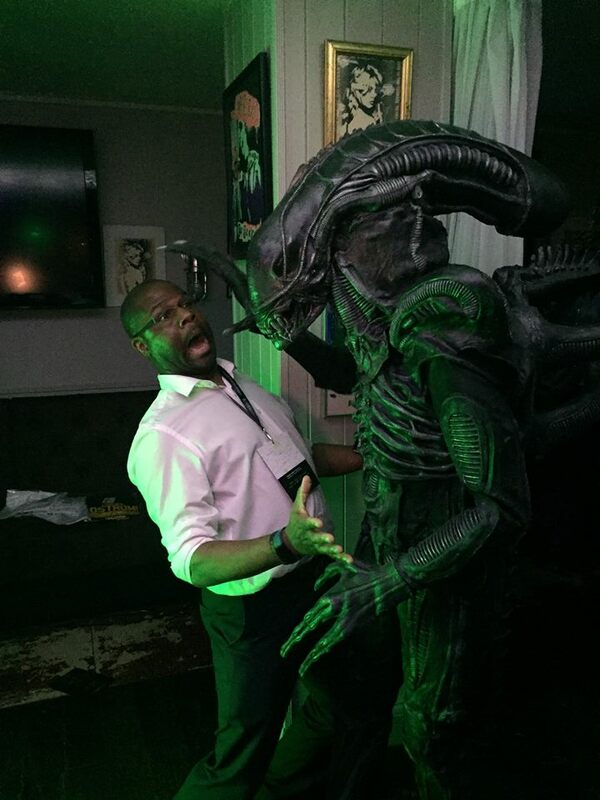 Ok right lets rewind back to the end of August then to a very cool event at a very special place, Windsor Castle! 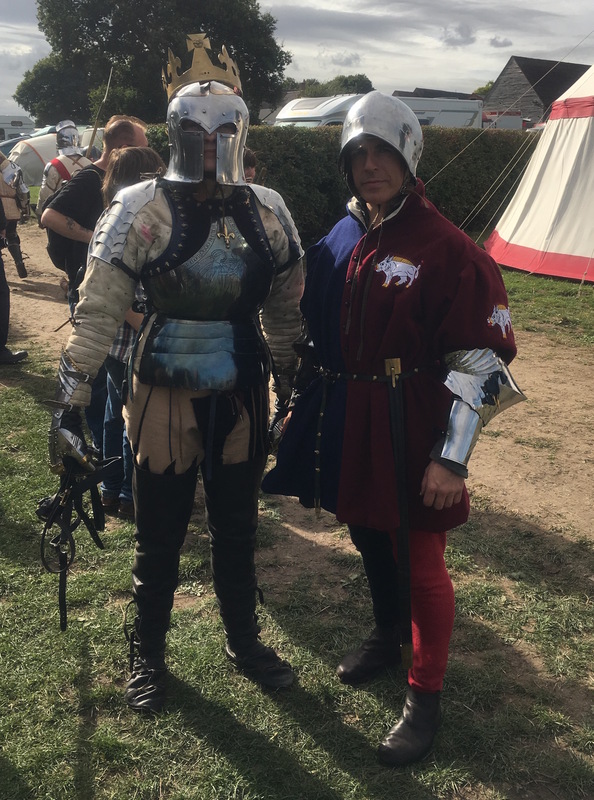 To get to do an event here is extremely rare and very special for that reason, a day of medieval activities and events were laid on for the public to enjoy. I was fortunate to be one of the many performers picked to be there for the day helping run the childrens sword battles. 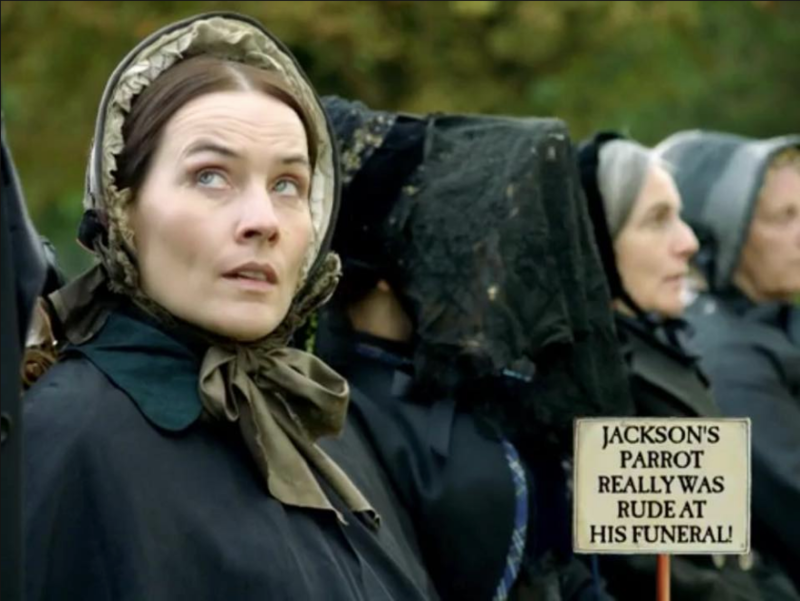 Some of the filming days I did last year for Horrible Histories TV show has aired, here is a nice shot of me on an episode about the funeral of American President Jackson. What was funny was his pet parrot who apparently said some naughty words during the service! With the DVD release of the new Alien Covenant film I was approached to by a promotional company to see if my alien Annabelle wanted to help them out by assisting them with some promo drops. 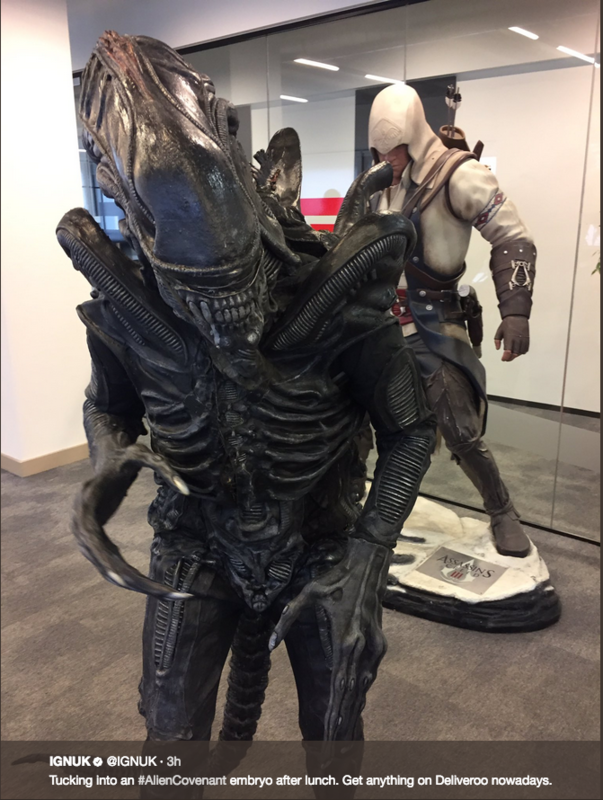 We spent the day popping into movie related offices for photo ops and delivering some alien foetuses and a copy of the movie! End of September saw Sean and I being invited back to the Starbase 24 event as guests. We had a great time chatting and making new friends and helping raise some money for Macmillan. Was great to sell a couple of my leather pieces too as well as a couple of copies of Tales of Albion film. Straight after the Starbase event we went to a friend of ours who is an amazing photographer for a photo shoot. 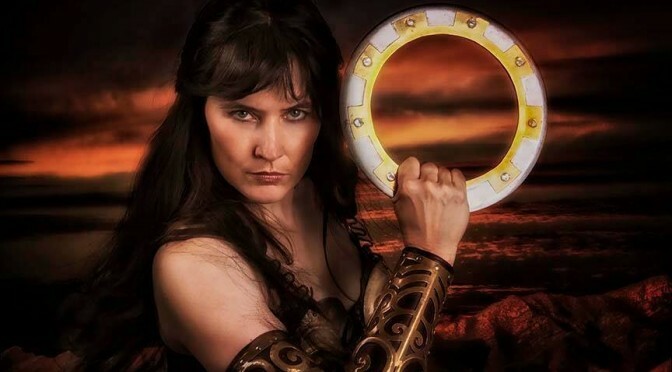 We have have done a previous shoot with Nicole before as she did the awesome Xena images you can see in my previous post. 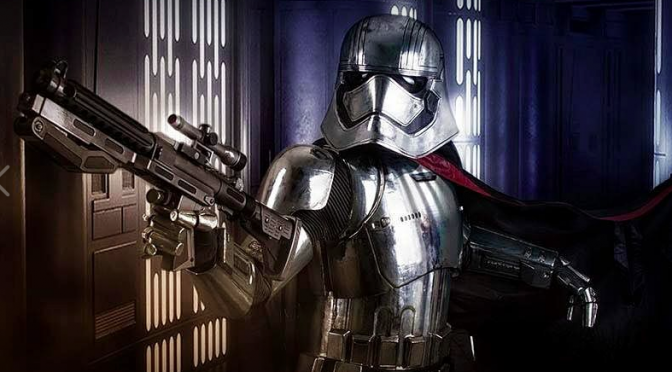 This time it was for my silver queen, Captain Phasma as ever Nicole did an awesome job as you can see from one of the photos above from the shoot. Further photos can be found either on my Facebook page or my Instagram page Xenajojo1. Have a few more commissions to contend with and some stormtrooper appearances in the pipeline so will report on those next report. Ok so I guess the next post will be in a few weeks so thanks for being here and catch up next month. 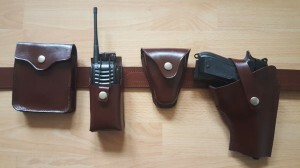 Yet again I find myself apologising for leaving it so long to post a report up! It has been a while so sorry for that. Ok lets back peddle to May Bank Holiday for the Gloucester Tall Ships Festival. Every 2 years they hold this event at the Gloucester Docks drawing huge crowds over the 3 day event. A beautiful array of tall ships were in attendance with attractions on and off the water with Sean and I along with our fellow performers put on several pirate shows through the day. Great crowds for the shows and the children seemed to love Cpt Jack Sparrow as he manages to squirm his way out of trouble again! 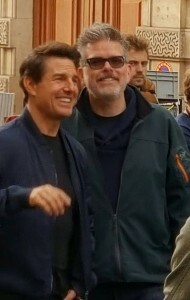 Sean and I went to the Cast and Crew Premiere in Leicester Square of The Mummy film starring Tom Cruise, really enjoyed it particularly with Seans involvement in the film. 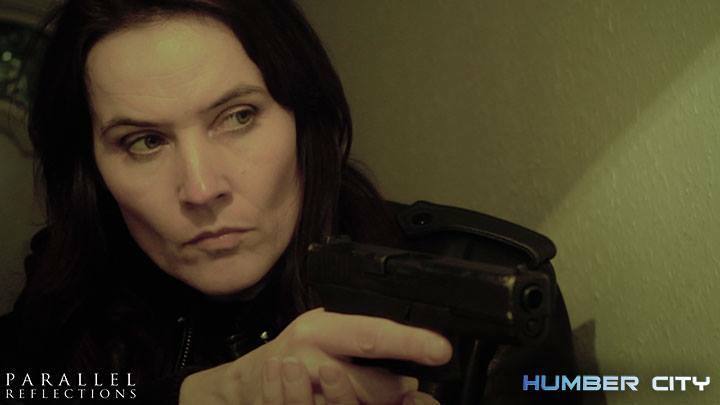 At last it seems I have finally wrapped on Humber City with my last days filming in July. We filmed at the Hull KR Stadium and I had a couple of scenes, one with the lovely Terry Molloy who played the baddie Davros from Dr Who. 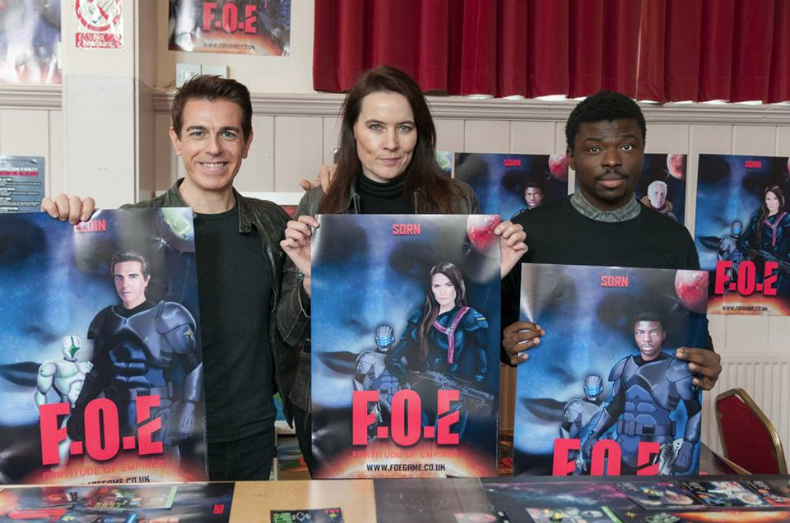 All went well and fingers crossed the cast and crew showing and wrap party will be in October. I will update when I know more. 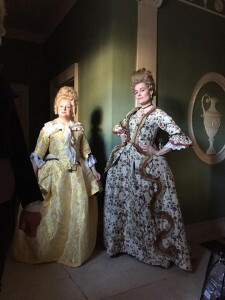 I did a days filming at Hampton Court Palace helping to dress Henry VIII for a documentry for a programme called The Private Lives of the Monarchs. Will keep an eye out when its due to air. Finally Sean and I made our annual appearance at the ABC Animal Sanctuary in support for their Summer Open Day to help raise funds for the welfare of the animals. Beautiful weather helped bring the crowds in. 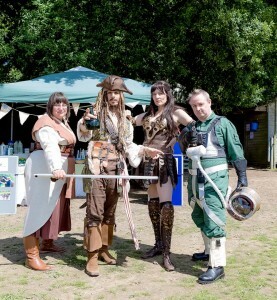 Along with some costume friends of ours we helped to add more money to the charity pots by asking for donations for photos. The day was a great success and hopefully will help all the lovely volunteers who care for the animals and the running of the sanctuary. So sorry in the delay in posting a new report, things picked up pretty quickly and l got swept up in it all. Ok so lets start where I left off last post. The HSBC photo shoot seemed to have gone well as apparently one of my images was a featured one but can I for the life of me find it on the web! I will keep looking but its a bit like looking for a needle in a haystack! 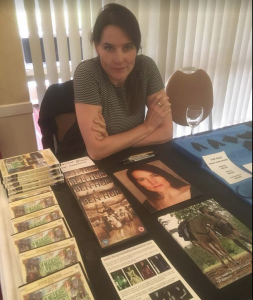 Again another trip up to Hull for more filming on Humber City, this time working with the lovely Sophie Aldred who played the doctors assistant Ace from Dr Who. 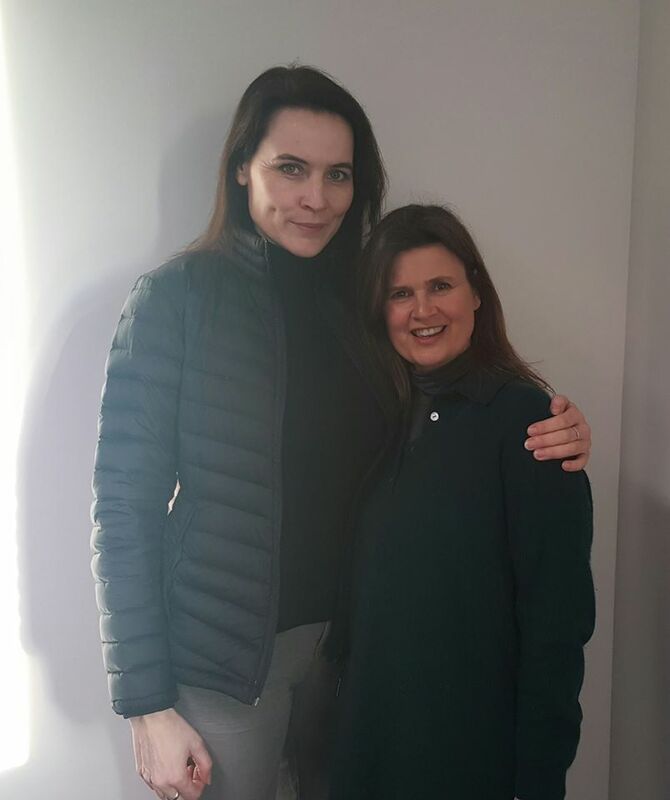 She was very sweet and a pleasure to work with. 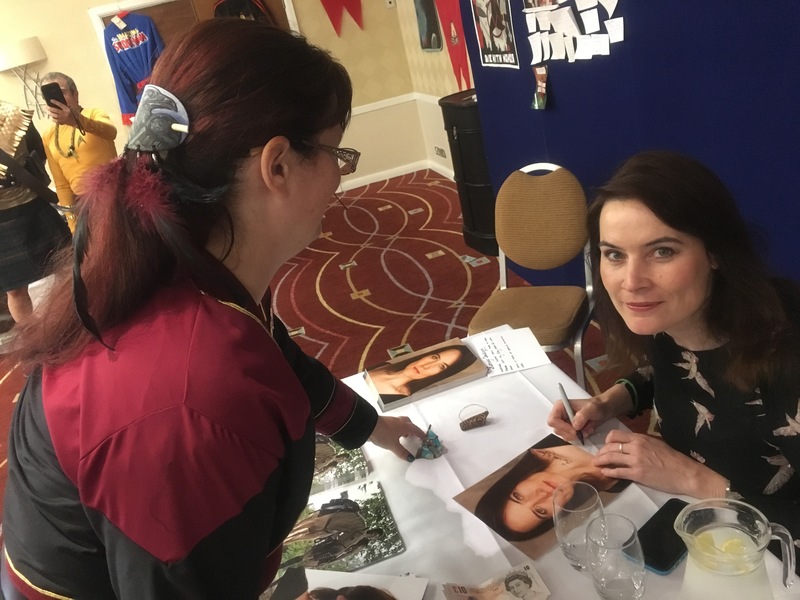 Also got to help out with the lovely Vic Mignogna (Star Trek Continues )scenes and looked after him for a couple of days before he headed to Memorabilia where we was a guest signer. Very sweet and was fun taking him to Cadbury World and he re-enactors market. 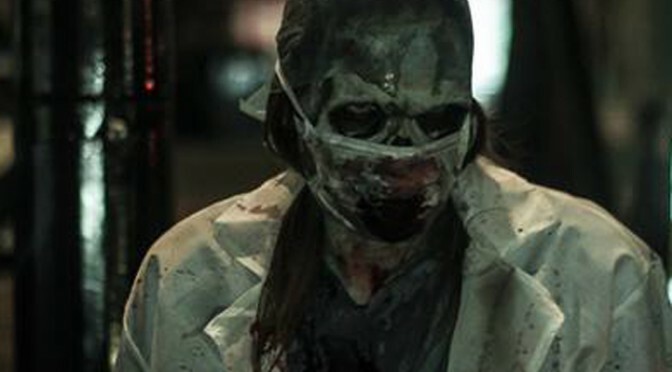 Still a couple more scenes to film and then done! Easter saw me performing at Dover Castle for the combined St Georges and Easter weekend. Lots of fun with storytelling and children activities. 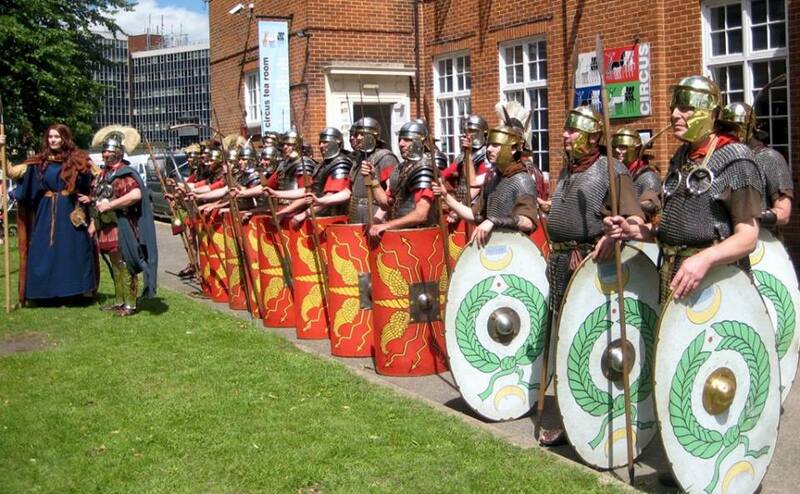 Then following weekend on the actual St Georges day I was at Woburn Centre Parcs alongside St George for a lovely relaxed walkabout appearance reminding people what day it was! 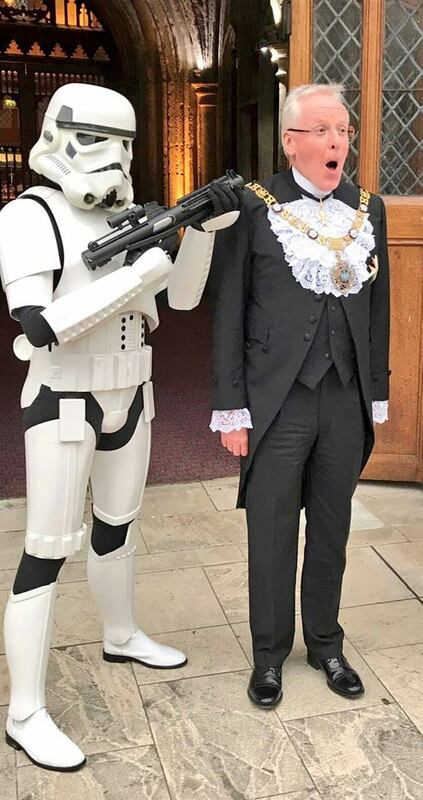 A great appearance as a Stormtrooper at the London Guildhall to help welcome over 700 guests to a large evening event. To top it all the guest of honour was the Lord Major of London! 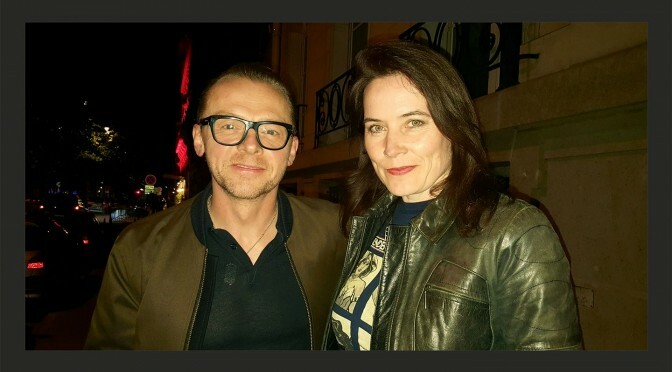 I then had a surprise weekend in Paris with Sean whilst he is working over there on a film, I was lucky to get permission to join him on set for a day and hang out with him. Watching the car stunts was awesome and exciting and getting the opportunity to meet the director Chris McQuarrie and also Simon Pegg at an evening event. The next day was Seans day off so we did some sight seeing and hung out with new friends which was great fun. Exciting weekend of adventures! Straight after Paris I got the opportunity to get Annabelle my Alien out of Quarantine for an Alien Covenant themed evening which was great fun to do. Great to use the costume again and see her in action! 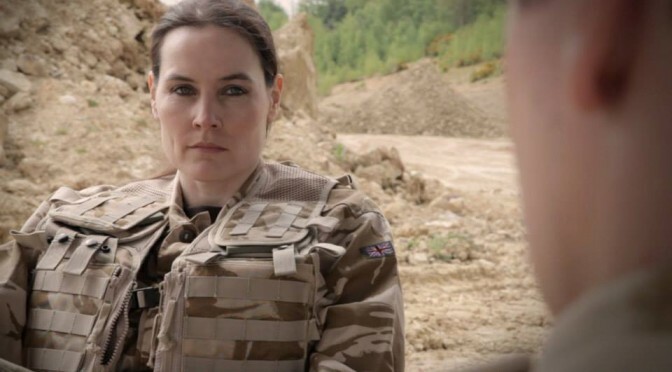 Filming wise for me has been a little quiet but I did do a commercial for Virgin Media, not sure when its out but will post more news as soon as I find anything out. 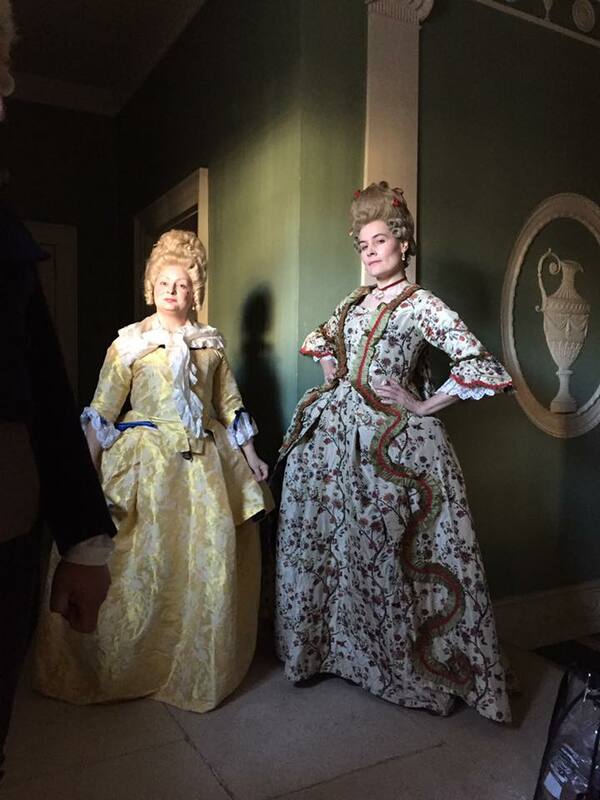 Also just done another historical documentary with the same company I did the Elizabeth I job, I was playing a lady for 2 different scenes for the series The Private Lives of the Monarchs. More details to follow. Mid June sees the return of the TV show Forbidden Histories on the Yesterday channel, you will see me in the episode about Mary Magdalene as one of her followers. 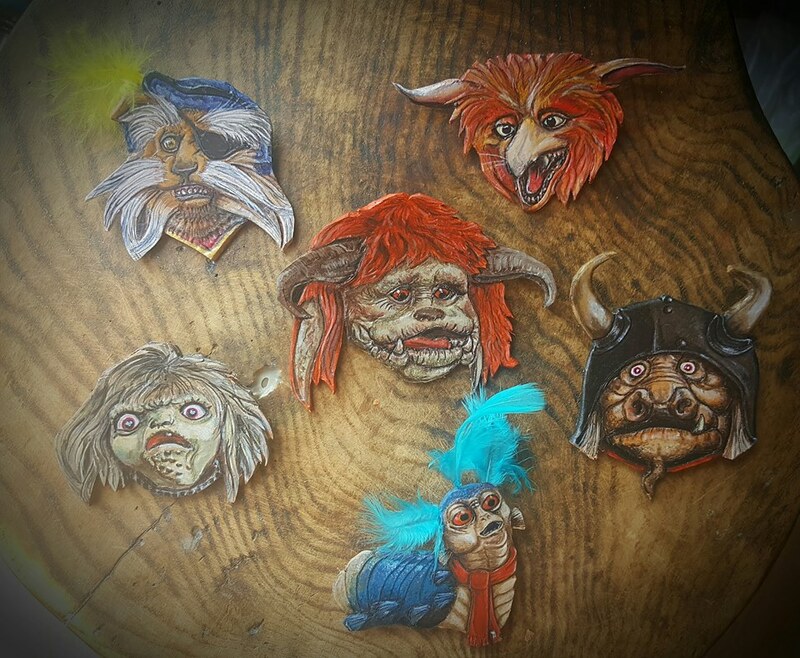 Had some great leather commissions for more Labyrinth characters which has kept me busy inbetween other jobs, really enjoyed making these new items, with more to come! Let me know if anyone wants one making! 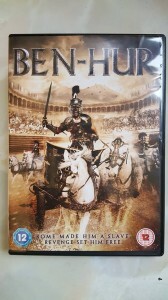 The same company that made the Ben Hur film I did are doing a new family adventure film which I am auditioning for in a couple of weeks, fingers crossed I get the role as she sounds great fun! More info as and when it comes in. Sean and I will be setting sail for the Gloucester Tall Ships Festival this coming May Bank Holiday, if you can make it I can highly recommend it, lots of fun for the whole family and we will be there swordfighting alongside other characters! 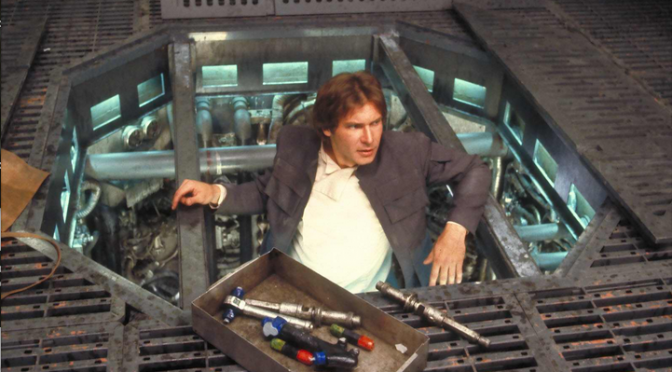 Ok thats it for now, thanks for bearing with my slow posts I will try to post up sooner than later for the next one. Happy Christmas to you all and thanks again for checking in on my adventures! 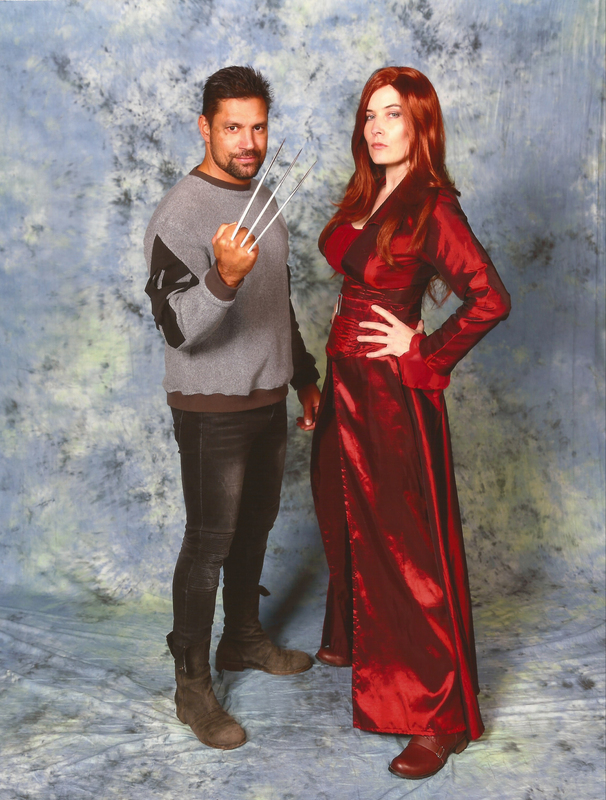 Going in reverse since I last posted, back in November Sean and I attended the Memorabilia Show at the NEC, this time for a change not as Xena and Jack Sparrow but as Dark Phoenix and Wolverine from the Xmen. Really nice change and it was less hectic which gave us more of a relaxed event which we could enjoy more. The one time I don’t dress as Xena and a Xena guest is signing! 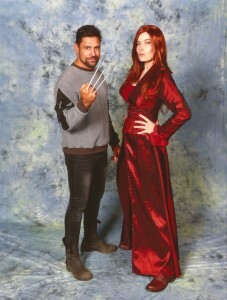 The lovely Manu Bennett was one of the headliners so thanks to Sean treating me I had a photo op with him. I asked to borrow one of Seans Wolverine claws for Manu to wear, I must say he would make an awesome Wolverine! 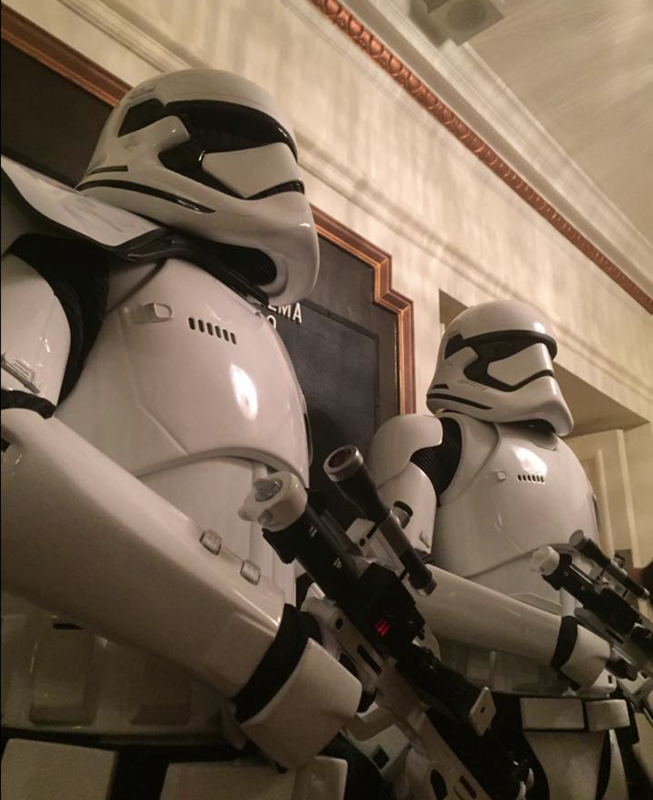 Had a great Stormtrooper job for a corporate event at Greenwich Planetarium which saw us being involved with a Mannequin Challenge which was a real laugh. Not sure if I will get a copy but will let you know if I do. We then whisked off upto Hull for some more filming on Humber City, filming a fight scene in very challenging conditions and a test on ones patience but we managed to get it done! Only one more shoot to go and I shall be wrapped! 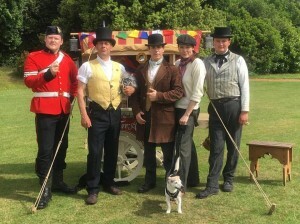 With the build up to Christmas I also took part in a few corporate events, a Western action show where I played the Madam of the Saloon which was loads of fun and a chance to shine in a new costume and role. Sean and I had the pleasure of working alongside Cineworld Cineworld escorting VIP competion winners for Rogue One film goers. 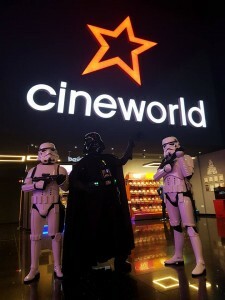 Alongside Darth Vader we went to 2 different cinemas over 2 nights which was really fun! My little Esty shop Xenajo Creations had a nice little flurry of orders come in, I have added some new lines to it but I also do private commissions so if you would like something made, let me know! Well thats it for the mo, Happy Christmas! Ok back tracking to September I attended the starbase 24 annual banquet as a guest with Sean along side my lovely friend John Carrigan and his wife Annie. The lovely Virginia Hey and J G Hertzler were also guest at an awesome event and all in aid of Macmillan Cancer Care. 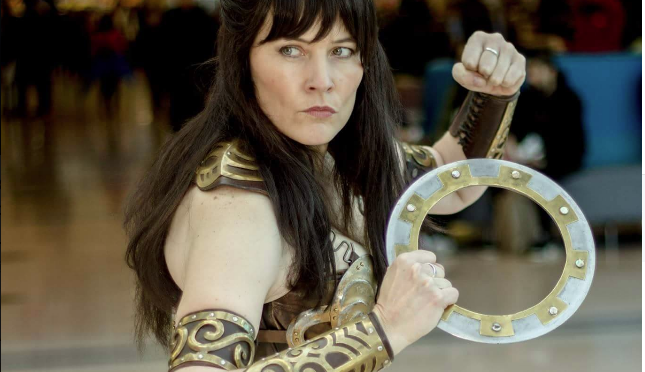 This was a lovely well planned event and I had the opportunity to appear as a special guest to talk about my filming experiences as well as dressing as Xena for the photo ops with proceeds going toward the charity pot. 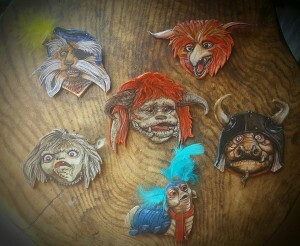 I managed to sell a couple of my leather hair barrettes as well which was great. It was a lovely event which I look forward to support again next year. I have also had the pleasure of working a few days on the popular childrens TV Show Horrible Histories. 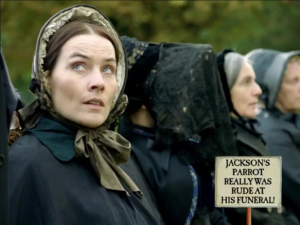 Such a laugh and a lot of fun to work on this series, I have been dressed in lots of different costumes and covering an array of time periods. Lovely crew and production, will find out when its due to air. Then the best part of this year, going on holiday to Los Angeles with Sean, staying with friends and experiencing new adventures and making new friends. Love visiting LA, it always presents new and exciting times, even more special when other friends are over at the same time. John Carrigan and Annie where there too and we spent sometime together having such a great time. We went to Universal Studios which is always a must when in LA, weather was great and company even better. We were also introduced to Anthony De Longis and his lovely wife Mary thanks to John and also to Ben Alpi and his lovely wife Jyotika, all lovely people and a pleasure to know. 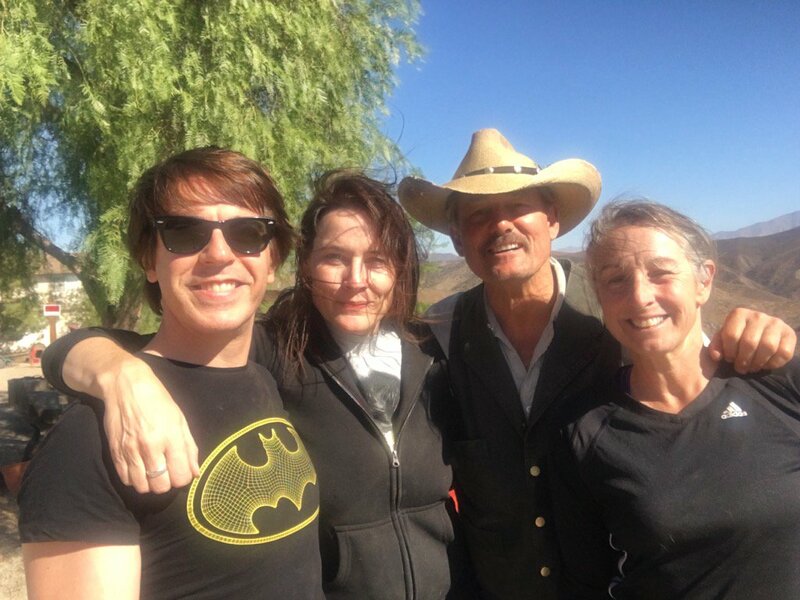 What was very exciting was getting a bullwhip lesson off the master himself Anthony, he trained Michelle Pfeiffer for her role as Catwoman and Harrison Ford as Indy! Flippin amazing!!! What an experience and I will follow it up with more lessons when over next in LA. We also visited my friends in Yucca Valley to spend time with them and visit Pioneer Town for good drinks and food. First day there we ended up on a 4 hour trail ride in the desert! Lots of fun times! 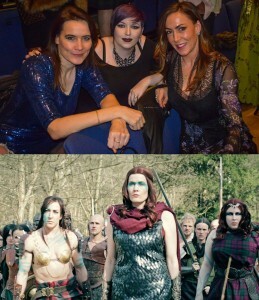 Whilst in LA I did a bit of filming for a little shoot which saw a fight ensue with Xena and Red Sonia! 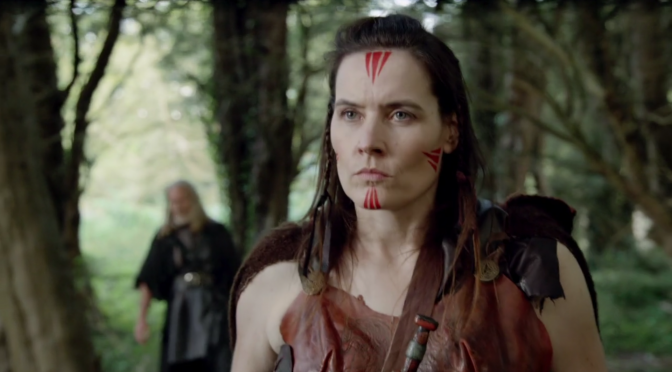 The actress who plays her contacted me before I flew over about the idea of the 2 amazons crossing swords. 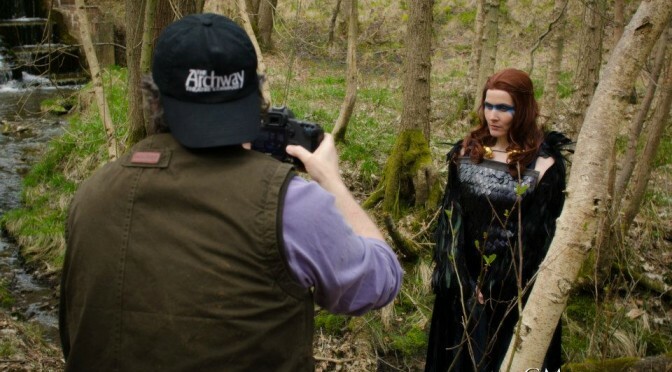 I took my Xena costume over with me and ended up shooting for a day in a glade. Not sure as and when it will be completed but of course will post on here any news or links. After all the excitement of Los Angeles and back in the UK Sean and I were heading down to Dover Castle for the Halloween holidays helping children make masks and spooky spiders! Great working with Griffin Historical again and thankfully the weather was kind and we had some beautiful sunsets most evenings. 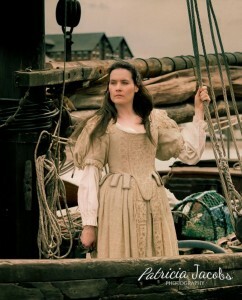 And finally some great news about the Tales of Albion film I did a while back. The film is now available for pre-order and will be available from the 12th December. Please follow this link for further details http://www.talesofalbion.com/ where you can order your copy. The premiere is being held on the 11th December which I will be at and will post some photo too. Very excited to see it completed and see all the hard work that has gone into this project. Please support the film by purchasing a copy! The photo at the top of this post is a shot from one of the days I was filming. Well thats it for the mo, I’m sure there will be plenty to post over the next couple of months so keep checking back. Just a bit of an update since the last post. 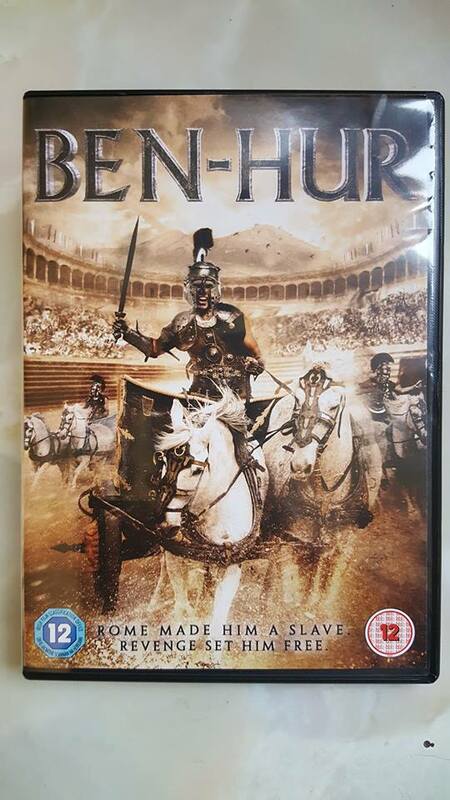 The DVD of In the Name of Ben Hur is now available in the shops too but the cover is a little misleading as it doesn’t have the full name on the cover and also the picture doesn’t really relate to the story of the film? Bit strange but there you go! 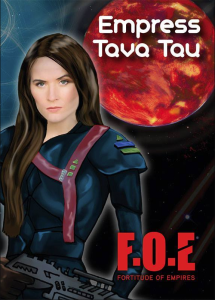 This is what the cover looks like if your interested in checking it out. Filming wise I did a days work on an episode of Forbidden History about Mary Magdalene at Chislehurst Caves, awesome location which has seen the several TV shows film there including Merlin. Have also done several days on Liam Neesons new film The Commuter as well as a commercial which has a massive Disney tie in, can’t say anymore on that but it was an awesome days filming. Have also done a few days stand in work on a big superhero film which was pretty cool, shame it wasn’t more days. Enjoying immensely working on the popular childrens show Horrible Histories and hopefully will have a few more days as the production is brilliant to work on and funny too. Filmed another day on Humber City in Hull, thankfully its nearing the end and hopefully will all be done in a couple more days of shoots and be wrapped by end of November. August saw the return of Boswoth Battle which I do love going to, mainly as its full of memories from years back and seeing old friends again. It would have been fun to say I played the King but Henry Tudor didn’t want the crown so he gave it to me after the battle! 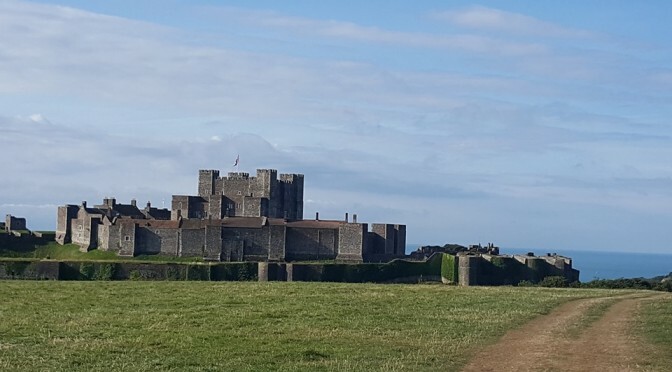 The school holidays saw me travelling down the the amazing Dover Castle twice over the month of August, first doing the craft activites helping kids make roman mosaics and the Bank Holiday running Gladiator School which was loads of fun. The weather was great and was a nice change to get out of doing the craft stuff and having fun with the kids. Well thats it for the mo and thanks for dropping by!